These twenty photomontages were made in the 1960s and 70s during a time of escalating war conducted by the United States military forces in Vietnam. 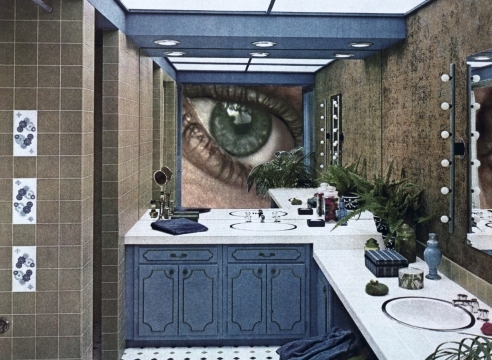 Combining pictures of Vietnamese civilians caught up in the war, taken from news magazines, with images of the homes of comfortably wealthy Americans published in home-decor outlets like House Beautiful, Rosler shows us the conflict as the ‘ living-room war’, a term applied to it in the United States. 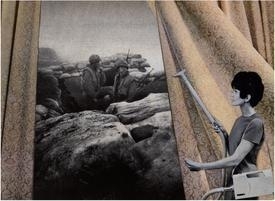 By urging viewers to reconsider the 'here' and 'there', these activist photomontages reveal the extent to which a collective experience of war can be shaped by images. Significantly, the photomontages are actually colour photographs of original collages, thus keeping the issue of hand-making at a distance. Made during the height of the war, they were originally disseminated on flyers and in underground newspapers and reflect the artist’s frustration with media images, reporting techniques, and even some anti-war propaganda.